Dear friends! From now on and till the end of October you can see few of my paintings in the Moscow Space museum. I am very happy to take a part in the exhibition project "Outside the Earth?" from the cycle "Space in Art". Me in front of my paintings at the museum. Photo from the exhibition opening. How to see the exhibition? Mon, Tue, Wed, Fri, Sun: 10 AM — 7 PM. Thu, Sat: 10 AM — 9 PM. 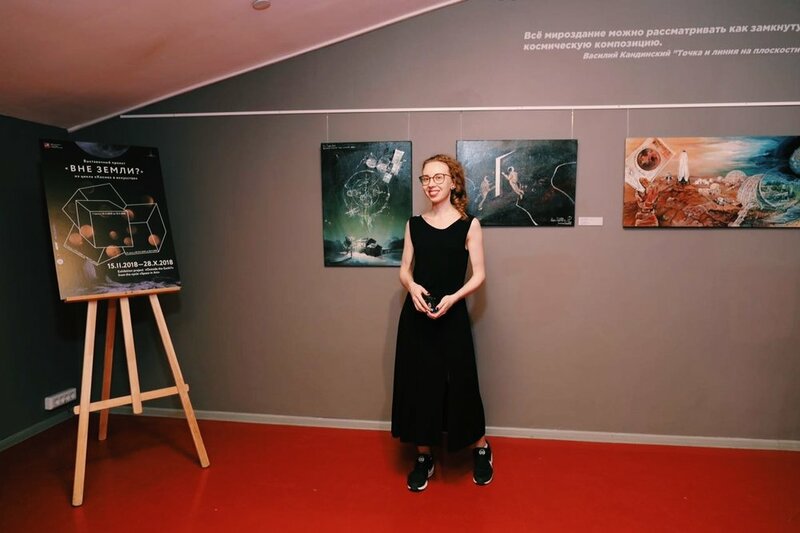 Three of my paintings are exhibited: "Making Humans a Multiplanetary Species", "The Door is Open" and "The Dreamer from Kaluga". "Making Humans a Multiplanetary Species" is a time-travelling storytelling painting - on the left of the painting is the beginning of the Mars colonization when on the right is the terraforming of the whole planet. "The Door is Open" is the symbolic painting inspired by Stanley Kubrick's "Space Odyssey". "The Dreamer from Kaluga" is my favourite painting, and many people ask if i sell it. The answer is still "No", but you can visit it in the museum and enjoy this story about Tsiolkovskiy there.